Uppsala, Sweden—March 22, 2013—Today, IAR Systems® releases a suite of tools for developing embedded applications based on Renesas Electronics’ new RH850 core. IAR Embedded Workbench® for RH850 includes user-friendly features and powerful optimizations that enable developers to fully benefit from the high performance offered by the new RH850 core. The RH850 microcontrollers are targeted for automotive applications and are the industry’s first with embedded 40nm flash technology. The series addresses functional safety and security requirements, while combining high performance and low power consumption. It offers features such as ultra-low power, high temperature tolerance, multi-core technology and compliance with the standardized automotive software architecture AUTOSAR (AUTomotive Open System ARchitecture). 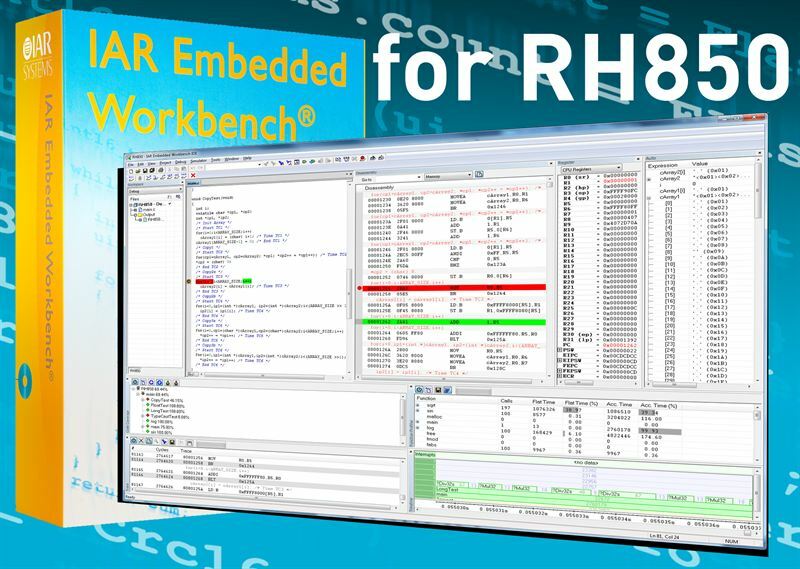 IAR Embedded Workbench for RH850 provides a complete set of development tools, with build tools and the comprehensive C-SPY® Debugger incorporated in a user-friendly integrated development environment with a feature-rich text editor and source browser. Tapping into the success of IAR Systems’ well-proven tools for Renesas V850, IAR Embedded Workbench for RH850 brings architecture-specific adaptations and optimizations for the RH850 architecture. One of the focal points during development has been to maximize the code performance and the IAR C/C++ Compiler™ for RH850 generates very compact, extremely fast-performing code by applying several levels of generic and processor-specific optimizations. The tools are well tested and comply with industry standards. They use the standard ELF/DWARF object format, and are compliant with Renesas ABI (Application Binary Interface), which gives users the possibility to incorporate libraries created with other Renesas ABI-compliant software tools. Integrated automatic checking of MISRA-C rules helps ensure the safety and reliability of the applications designed. The C-SPY Debugger supports Renesas E1/E20 emulators, as well as kernel-aware debugging with built-in plugins for a large number of real-time operating systems (RTOSes). Thanks to its strong partnership with Renesas Electronics Corporation, IAR Systems is the only tool vendor that provides high-performance development tools for all Renesas architectures, in total more than 4000 devices. In a common user-friendly environment, IAR Systems’ customers can move freely within the entire line-up of Renesas microcontrollers. Read more about IAR Embedded Workbench for RH850 and download free evaluation licenses from www.iar.com/ewrh850.